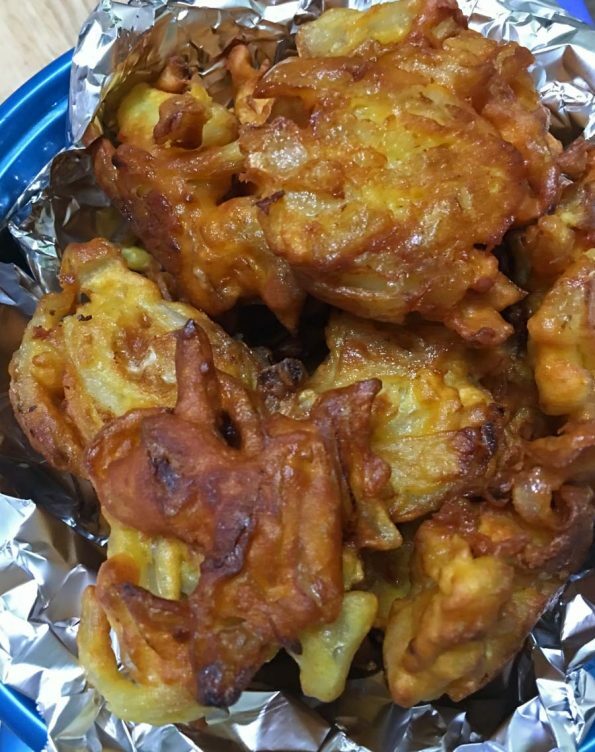 This is a very simple ulli vada recipe or South Indian Kerala style onion pakoda recipe which you can easily follow to make crispy onion pakodas at home. Ulli vada (as known in South India, Kerala) or onion pakoda is Indian style onion fritters made using spices and chickpea flour which is very delicious and served with tea in the evening as a yummy and easy snack you can prepare quickly. You can make this snack spicy or less spicy by adjusting the amount of chilies or by skipping the chilies as you wish. If preparing for kids, you may skip the chilies altogether. 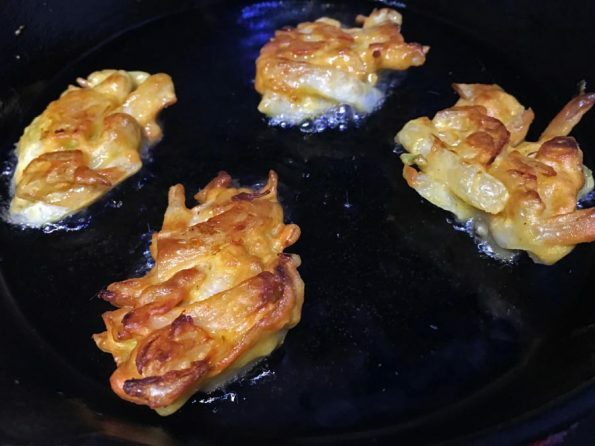 The restaurant style ulli vada or onion pakoda made in Kerala style, usually are bigger in size and made using more flour, which is very delicious and filling, however this homemade small sized onion pakodas are more easy to make and very delicious too. The process of making ulli vada or onion pakoda at home is very simple and easy to do, if you have chopped onions. 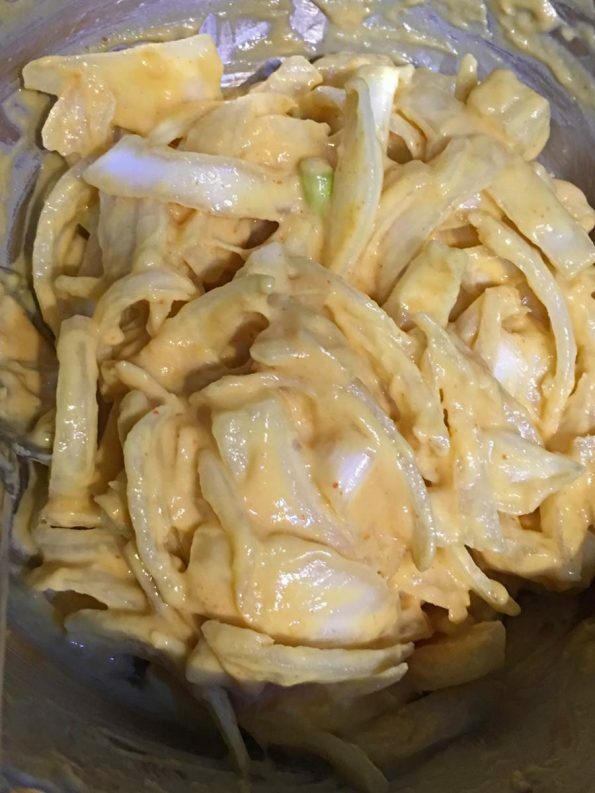 You just need to slice the onions, make the batter by mixing enough chickpea flour (besan flour), water, salt and spices , mix in the sliced onions and then deep fry spoon full of batter by dropping the batter gently into hot oil. I used garlic powder in this ulli vada recipe, but you can also use finely chopped fresh garlic. 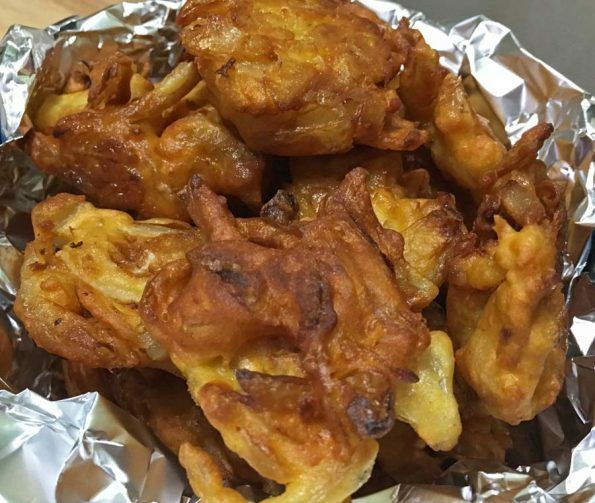 You do not need to use a lot of batter at a time, you can just use spoonfuls of batter to make small onion pakodas. 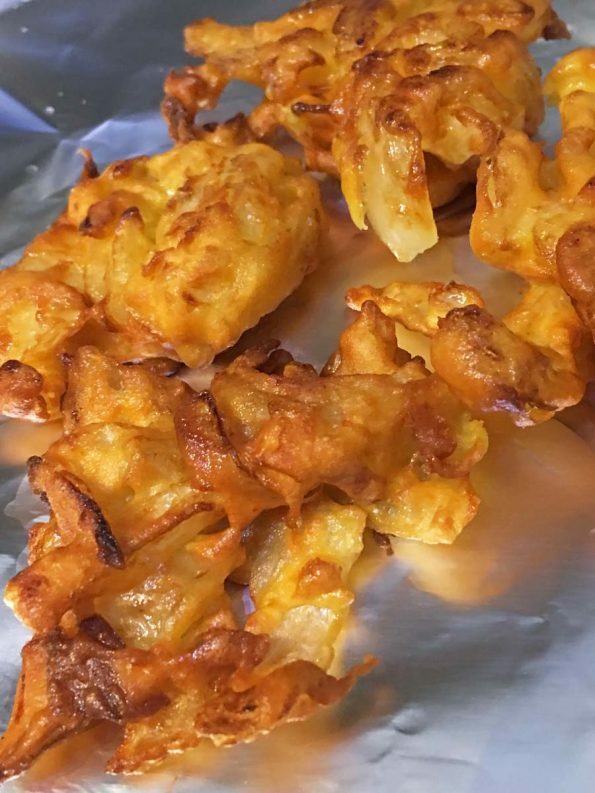 You do not need to worry about the small size or the irregular shape of the pakodas, as this is totally normal for onion pakodas. 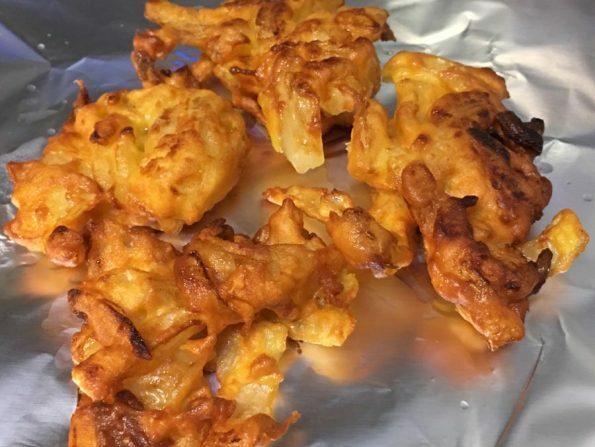 If you are a beginner, the batter may look like the onions are going to fall apart, but as you gently drop the batter to the onion, they stick together and make nice onion pakodas! So here is how you can make ulli vada or onion pakoda following this easy Kerala style ulli vada recipe. Ulli vada or South Indian Kerala style onion pakodas or onion fritters made with chickpea flour and spices make very yummy snack with tea or coffee. Wash and slice the onions in slightly thin long slices, transfer the sliced onions to a large bowl, mix with enough salt and keep aside (if you are using chopped garlic instead of garlic powder, mix it also with the onions and salt). Slice the green chilies in small round slices and also chop the curry leaves (if you are using these) and mix in with the onions evenly. If you are preparing this for kids, you may skip chilies. In a different bowl, mix together the dry ingredients - chickpea flour, rice flour, enough salt, turmeric powder, red chili powder and garlic powder. Transfer the dry mixture to the onions in the bowl, mix well using your hands so the onions are well coated with the dry flour mixture. Add the water also to the bowl and mix everything very well. 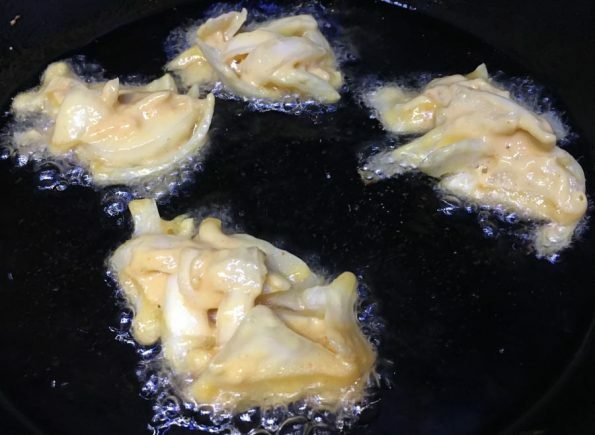 If you are preparing this onion pakoda for the first time, you may feel the batter needs more water, but this much water is perfectly enough to make the pakodas and if you add more water it may not come out right. Just mix everything together until well combined. Let the mixture rest for about 5 to 10 minutes. Meanwhile heat the oil in an iron skillet or frying pan. When the oil is hot, keep the heat in medium and gently add tablespoon full of batter to the hot oil. 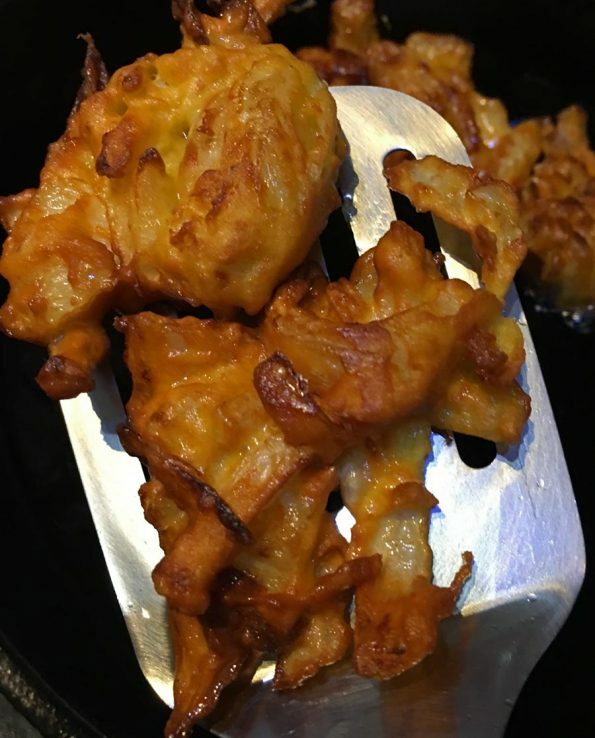 I prefer to make small sized pakodas as they are easy to deep fry, so I recommend using a tablespoon of batter. Just make sure not to overcrowd the skillet or pan, as we need enough space to flip the pakodas. 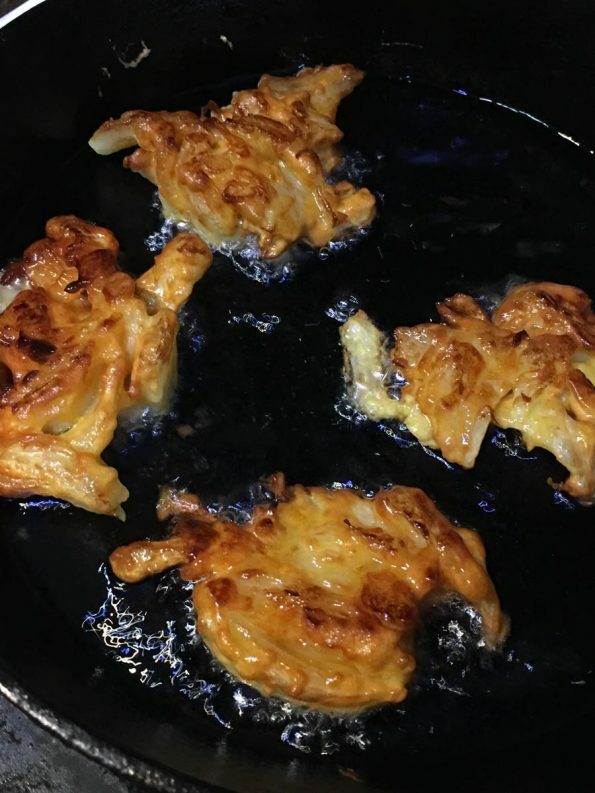 I usually fry about 3 to 4 pakodas together in a medium sized skillet. 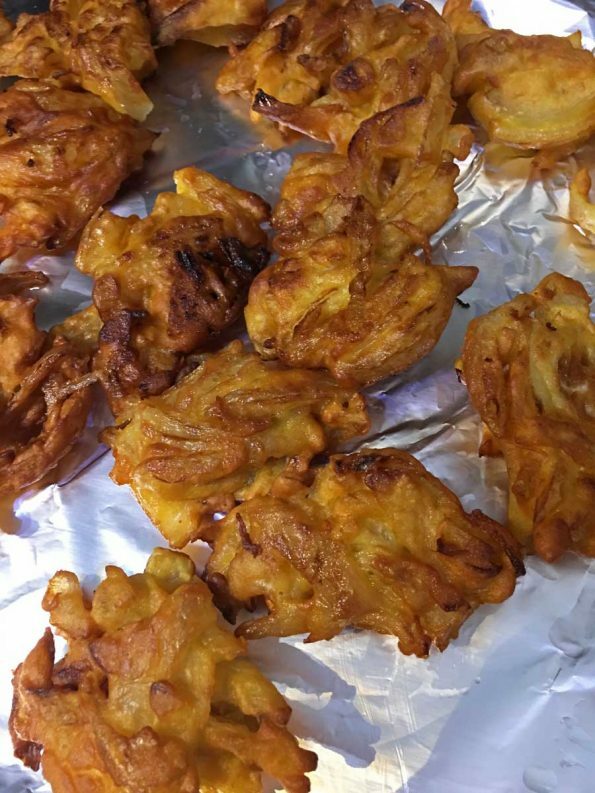 Once the bottom side of the pakodas start turning brown, which happens in about 1 to 2 minutes of time, gently flip the pakodas using a spatula and spoon and fry the other side too. 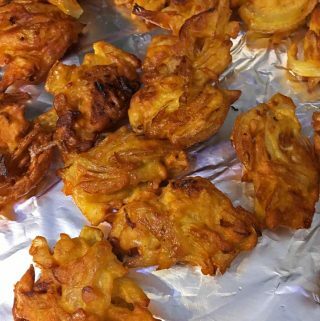 The pakodas turn brown so fast so make sure to adjust the heat between medium and low as needed and keep watching so as to not burn the pakodas. You can flip the pakodas again if needed so as to fry all sides until golden brown which is when the pakodas will become perfect! 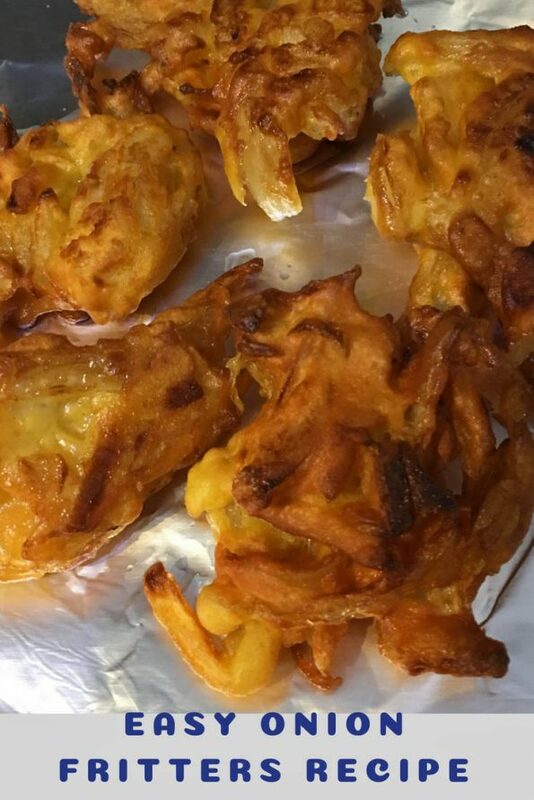 Similarly fry all the onion pakodas in multiple batches until all the batter is finished. Serve the onion pakodas hot with a cup of milk tea like cardamom tea, which is a perfect, delicious combinations! 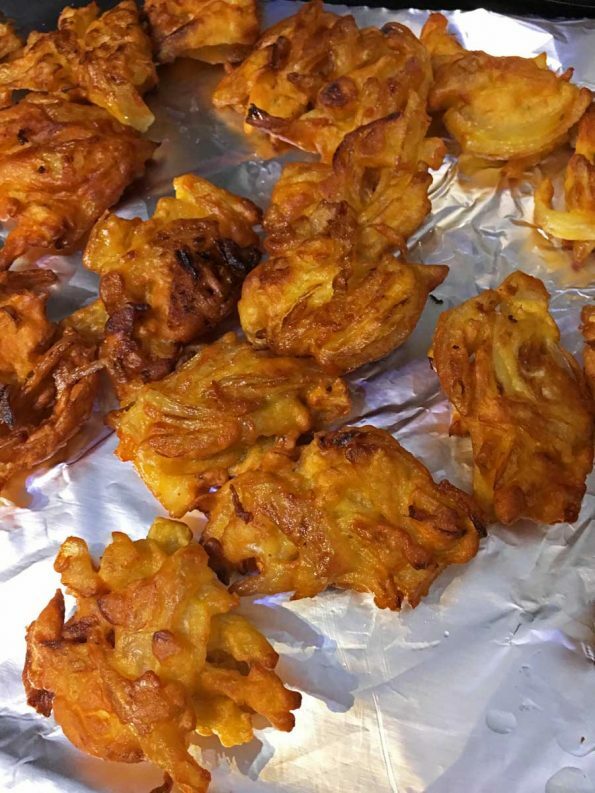 Hope you found this post on ulli vada recipe Kerala style helpful in making easy and yummy South Indian Kerala style onion pakodas or onion fritters for snack!